light night rains: Schneeweißchen, or Snow White. 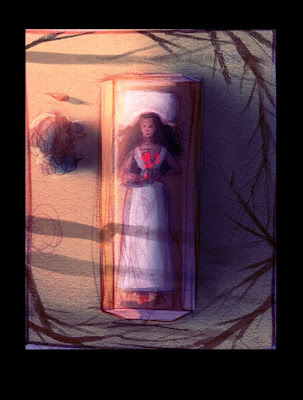 Here is the piece that first came to me when I was thinking of doing a show of fairy tales. 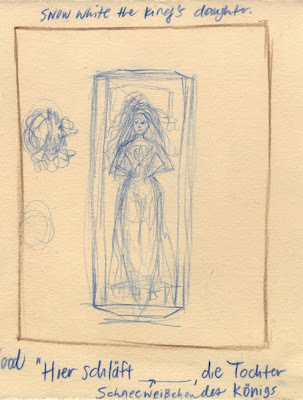 Snow White in the glass coffin. 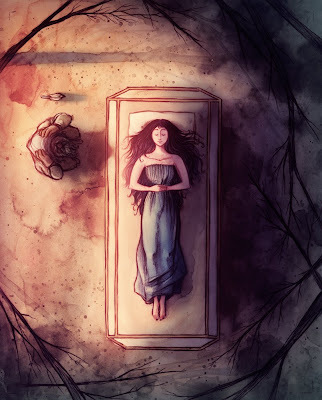 There's just something terrible and immensely beautiful about it (the idea, that is, not necessarily [but hopefully] my drawing) The princess is mourned, the girl whose skin is white as snow, lips red as blood, and hair black as ebony lays dead and yet, she's not, she's only sleeping. She will wake up. It may be silly but it shakes within me strong emotion. J. R. R. Tolkien a writer who I'm sure many of you are fond of, developed a concept he called "eucatastrophe" -- a good catastrophe, a sudden turn of events in which the outcome is joy, not sorrow. I don't know how often this happens in life, but it surely must be one of the most beautiful ideas in the world. It gets me every time I think of it. I don't have my original thumbnail here, but I can upload that tonight. The (close) to finished drawing. Again, work goes well, I have gotten enough movement back in my arm to make the drawing not as uncomfortable as it was before. I am closing in finishing the drawing for number 8 (of 10) which I'll let you in on a little secret is the story called "The Fire Bird" or "Tsarevitch Ivan, the Fire Bird and the Gray Wolf" and it is a Russian folk tale. Next post : "The Four Clever Brothers" or the story that's so awesome because it's got a princess and a dragon sitting on an island in the ocean. "...the girl whose skin is white as snow, lips red as blood, and hair black as ebony..."
Your color comp doesn't reflect this description in your note! The cloth she is laying on is whiter than she is. Yeah, unfortunately skin as white as snow and red blood lips look frightening. The dark hair will win though! She'll have paler features but not ghostly white. I think that'd be scary. Cory, First off.. LOVE your Work man! Between you and Justin, Portland Studios Sounds like a Job from the HEAVENS! also, I wanted to ask you, what type of paper do you work on? like this Snow White Piece? What type of Board is the final drawing on? And the Thumnails? what paper is that on? Thanks! and keep up the great work! You truly are an inspiration! Also! ... please put the layered files of the Scarecrow back up on the PS Experiment blog! PLEASE! I need to pick brain!... er.. I mean... your layers..
... it surely must be one of the most beautiful ideas in the world. To my mind, this is part of what gives The Lord of the Rings its thematic heft. I usually draw on "graphic natural white" from Graphic Chemical and Ink Co.
That's what the final drawings are on and the roughs. I was introduced to it in school and loved it. I've rarely drawn on anything else since. It just takes the pencil so nicely.